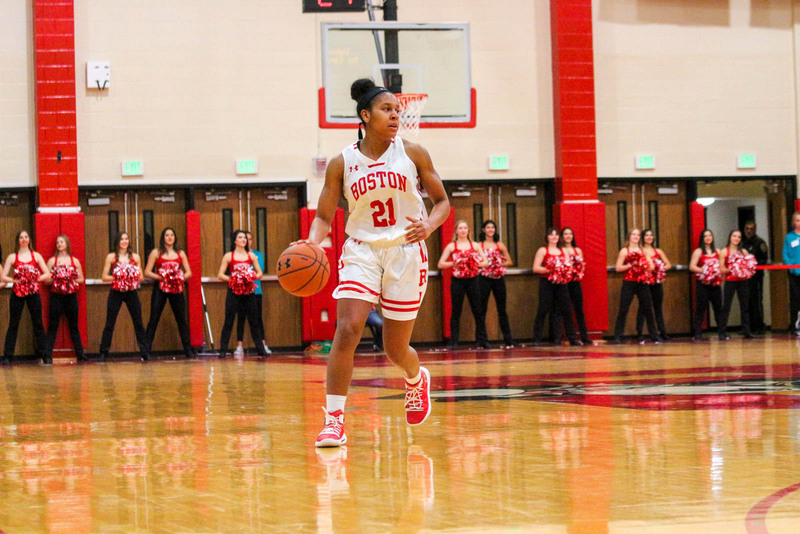 Last season, the Boston University women’s basketball team alternated its first five games for a 3-2 record. It went on to end the season with a six-game losing streak including a 66-61 loss to Lafayette College in the first round of the Patriot League tournament. With split results in its opening two games, the Terriers beckoned in a new chapter in program history under head coach Marisa Moseley in her first year as a collegiate head coach. In the season opener, BU fell 81-51 against Northeastern University after being down by nine at halftime. Three days later against Brown University, Moseley said she spoke to the team about focusing small blocks of time. Against Northeastern (2-0), senior guard Lauren Spearman was the only player to break double digits with a career-high 14 points. In the following match, senior guard Payton Hauck and junior forward Nia Irving both earned 16 points while sophomore guard Katie Nelson and freshman forward Ashley Sieper both put up 10. The team will next face off against Marist College on Friday at 7 p.m. in Poughkeepsie, New York. Marist (1-0) played a 20-win season through 2017-2018 and played for a 72-48 win over the Patriot League member United States Naval Academy in its season opener. The Red Foxes have come out on top over the Terriers in their last five meetings and have maintained its starting five players and nearly all of its scoring from last season. Moseley said BU’s focus on defense and scouting helped the team during its win over Brown. A native of Springfield, Moseley played at BU for four years before joining Geno Auriemma at the University of Connecticut in 2009. Last April, she became the first alumna to be named head coach of women’s basketball. While the Monday game against Brown was her first win, she focused on what it meant for the players. Moseley was part of a full-staff turnover and brought in with her assistant coaches Darren Bennett, Kate Barnosky and Elizabeth Belanger. Before coming to BU, Bennett served as the head coach of Skidmore College’s women’s basketball, a Division III program, for 14 years after spending six years as an assistant at the DI level. Barnosky came from across the Charles after spending five seasons at Tufts University, following a career there as a student athlete where she served as a captain for three years. Also a former student athlete, Belanger spent her time at the University of New Hampshire. The Acton native was an America East All-Conference selection three times. Moseley announced her first incoming class Wednesday consisting of three guards and one forward. “In our short time here, my staff and I have been able to assemble a talented group of players, and more importantly people, who will make an immediate impact on our program,” Moseley said in a press release. Two of the players, Annabelle Larnard and Maren Durant, hail from Massachusetts. Larnard, a guard from Scituate, finished her career at Fontbonne Academy having served as captain for two years and produced over 1,000 points. She spent a postgraduate year at Northfield Mount Hermon before committing to BU. The lone forward and Winchester native Durant is the current captain of The Rivers School and has been named to the All-Independent School League team twice. Also the current captain of her high school team, guard Maggie Pina has earned a multitude of league and region recognition and led her league with 17.7 points per game. Guard Liz Shean will be entering her second season as team captain at Yorktown High School in Arlington, Virginia, where she was named the Offensive Player of the Year.